This September, RNIB will pilot a free subscription service for newly registered customers who engage with RNIB Group Eye Clinic Liaison Officers (ECLOs). The 'Bright Box' is a new initiative for ECLO patients, who’ve recently registered their sight loss, offering appropriate and ongoing support from RNIB. Patients will be sent repeat packages, containing free products and information. Inside the first Bright Box will be small practical products including a notechecker which will help users distinguish the monetary value of different bank notes and a signature guide which can be used to help people sign documents in the right place. Information leaflets about RNIB services will also be included letting people know of the ongoing support RNIB can offer to all people at any stage of the sight loss journey. ECLOs will distribute leaflets about the Bright Box to raise awareness among recently registered patients who they think will benefit from the support. 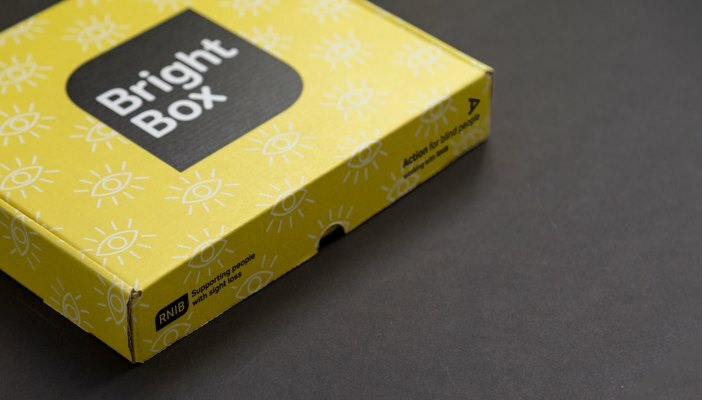 Patients can then subscribe to receive the Bright Box by either completing the return post form in the leaflet, calling the RNIB Helpline or by going online. As well as being printed in contrasting colours, the information inside can be provided in the receiver’s format of choice. The Bright Box has also been designed to be accessible for those who are less mobile as it will be mailed directly to their home. The pilot involves 500 Bright Boxes, and if successful, RNIB hopes additional funding will allow more people across the UK to receive the support. RNIB will be incorporating feedback gathered from users of the Bright Box to understand the best length of time and frequency for the Bright Box on a wider scale. To find out more, please email [email protected].